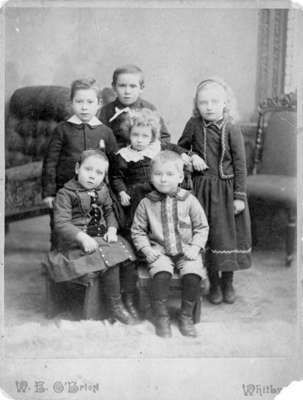 Black and white negative of a studio photograph of a group of children believed to be those of Thomas and Catherine Wilson. This photograph was likely reprinted by W.E. O'Brien in the 1880s. W.E. O'Brien arrived in Whitby in 1884. Thomas Hall Wilson (1837-1913), eldest son of James (1807-1890) and Elizabeth (1818-1889) Wilson, married Catherine DeGeer (1837-1913) at Whitchurch Township in 1858; they had six children: Mary Hannah Wilson (1860-1942), William James Wilson (1862-1915), Amanda Elizabeth Wilson (1864-1952), Charles Herbert Wilson (1866-1943), Kate Annett Wilson (1869-1953), George Iolum Wilson (1872-1954). James and Elizabeth Wilson emigrated from Yorkshire, England settling at Whitby in the 1830s. Thomas was a harness maker and operated a toll gate on Concession 1. He also took up other trades throughout his life. George Wilson was an Oshawa-Whitby photographer. He was the successor of the Whitby photographic studio operated by Stedham & O'Brien at the corner of Dundas and Brock Streets.